The Glam Goldie's Twin Backpack Antracite is a real space wonder and as a Twins Diaper Backpack has enough room for everything you need for twins, available at your fingertips. Product information "Goldie Diaper Backpack for Twins, Anthracite"
description & equipment The Glam Goldie Twin Backpack Antracite is ideal for parents who have their hands full. 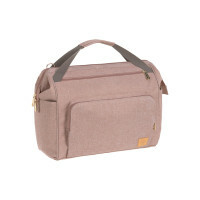 The Twins Diaper Bag offers enough space to store plenty of things. The XXL space wonder is particularly convincing due to its well thought-out features – a very large, water-repellent changing mat, a removable food jar holder, a water-repellent wet compartment as well as other practical compartments. 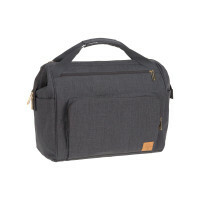 In addition there are various pouches for a cell phone, keys and pens in the front pocket. It also includes a pacifier pouch for two and the insulated removable bottle holder in XXL format is also designed for twins. The 3-in-1 version makes it possible for the Goldie Twin Backpack to be used as an XXL backpack, as a handbag or worn as a shoulder bag. The backpack straps and stroller hooks can be easily stored away in the back pocket, when necessary. The extra large opening at the top is particularly practical as it makes the spacious and well thought-out inner compartment easily accessible. Goldie's Twin Backpack is an all-purpose bag – as a weekender it’s a great companion too.